Angel Villavir, left, said traffic seemed heavier but the street was easier to cross. As inner Southeast Division Street grows up — literally, thanks to its new hedge of multi-story apartment buildings — Portland’s transportation bureau decided in April to redesign a section of the thoroughfare a bit further out to feel more like the city street it now is: with better walking and biking plus a regular flow of slower-moving traffic. Instead of four narrow travel lanes, Division between 60th and 82nd now have one bike lane and one auto lane in each direction, plus a shared center turn lane. We wanted to know what local folks thought about the restriped street. So I pedaled down during the Monday evening rush hour, stashed my bike around a corner, and walked around introducing myself as “a reporter” and asking what people thought. 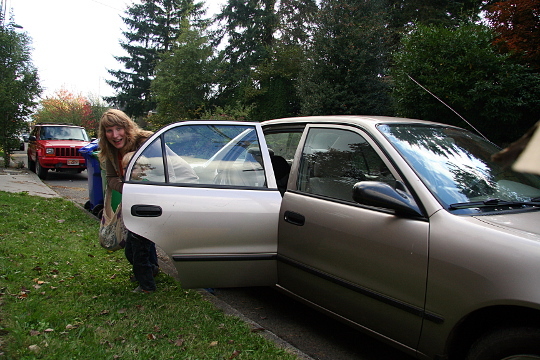 I learned two things: That everyone I met more or less likes it, and that low-car life is now very common in mid-Southeast Portland. to make her want to raise children in the area. Angel Villalvir, who said he lives in another nearby apartment building, said traffic was “a little crazier” since an auto lane was removed, and cars sometimes back up. But he didn’t mind. A weathered blond man pedaling westward in the bike lane was proud to endorse the changes. “”It’s the best idea they ever had,” he said. 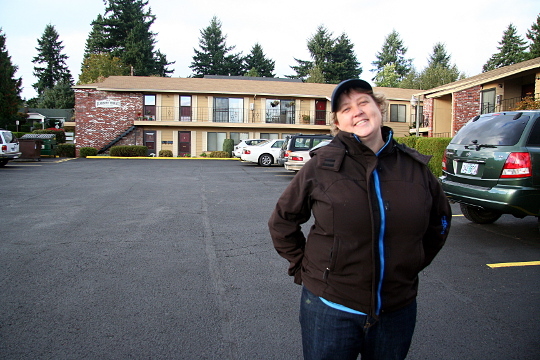 “They did that to another street here, too — Holgate. They say Portland’s the most bike friendly city there is.” Asked if he could pause for a photo, the man said no and quickly pedaled away. Emily Burke said traffic flow seemed about the same. Emily Burke, hoisting her young son out of their car at a house just north of Division, called the changes “a good thing,” making turns easier and reducing obstructions from buses or left-turning cars. Ron Lowery, smoking a cigarette with friends while they looked out on the street, said the traffic seemed to back up more but that “the bike lanes are nice.” He said he, too, got around mostly by bus. Though Division is definitely not crowded with bikes this far east, I saw 15 to 20 bikers — various ages, mostly but not entirely male, plus one father and two kids — in the half-hour I spent on Division at 76th. One man was riding in the sidewalk, as many did before the redesign. In an interview with the Portland Tribune last week, city spokesman Dylan Rivera said the changes will actually reduce average auto travel times, thanks to the new turn lane. What’s definitely different about the new street is that more cars are moving at or below the 35 mph speed limit, something only 44 percent did before. The city also has yet to install traffic detectors at stoplights, something likely to reduce backups. The Division restriping is one of several the city is pursuing on major streets in the mid-east side. NE Glisan got a similar redesign this summer between 67th and 80th, but with parked cars rather than bike lanes on each side. Foster Road is in the midst of a similar process. Then there’s the other side of 60th, the start of Division’s fast-growing commercial and residential district. 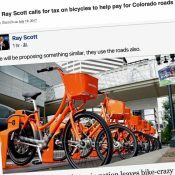 Here, real estate becomes more expensive, foot traffic more economically important and biking more common … and, ironically, it’s also where the city begins to devote 40 percent of the street to unlimited free storage of private vehicles. Southeast Division still has a lot of city-building left to do. I really liked this anecdotal vox populi reporting. Human interest: popular for a reason! 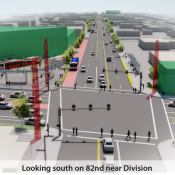 Is it too soon to start lamenting the botched inner Division reconstruction like we lament the missed opportunity for bike lanes on Hawthorne in the 90s? As an extremely frequent user of the new Division route (SE 76th to SE 60th) I am more than thrilled that PBOT decided to reorganize the street. I want to really make that clear. However, at the risk of sounding like I am looking a gift horse in the mouth, I do feel like there is quite a bit of cleanup and detail work still necessary. The new bike lane could use some serious smoothing as it is rutted, rough, pot holed, has obvious storm grates fully in the path and has a right leaning slant along much of the lane. This is obviously a wonderful addition to our bicycle network but completely finishing off the new path would be tremendously appreciated. I agree. That sunk-in manhole right in the middle of 69th going westbound is a deathtrap, in addition to the many other problems. Would have been better to wait for a change in alignment until after the road was repaved. Never got any flats in this stretch back when I simply took the left lane. “Northeast’s Boise neighborhood had become ‘douchebag central? '” Yikes! Anyway, it’s great to hear the perspectives of the natives in that area. I am thrilled about the lane, since I sometimes use Division to ride down to 76th (I think that’s the road) and head over to Mr. Plywood. All I can say is that the change helps me conduct business with less stress. I’m not sure how she meant that comment, but it is my favourite sentence in the whole piece. Boise neighborhood=douchbag central: I’m still laughing out loud! This is always the struggle staff at local jurisdictions have when designing a roadway with constraints (cross section width, budget, etc. )…who do you design for…the local adjoining users access and safety or the regional MV commuters? And as a former resident of a street without parking (the City removed in the 1980s? for 2 way car capacity vs. 1920s queuing operation) I got to love that I did not have parked cars in front of our pretty home. And it made sweeping the gutter easier and walking biking to the house easier too. Yes we did have to park either in the rear alley or across the street 50 to 300 feet away…very minor inconveniences in day to day life. Guess what, Andrew! There is a low-stress and sustainable Greenway just one block away! It follows a pleasant meandering route and features soothing speed bumps, attractive cycling art, and bioswales! Guess what, the parallel greenway doesn’t really work if your destination is actually on SE Division. I think the previous comment was supposed to be tongue-in-cheek. 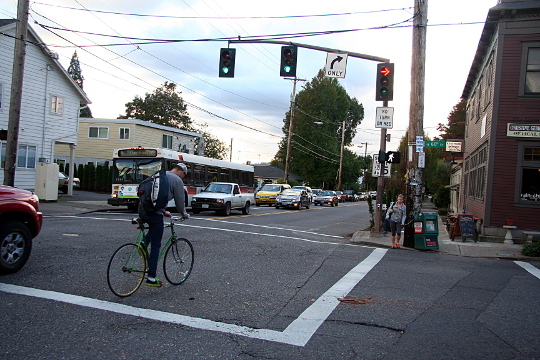 For me, the only slightly uncomfortable part of the road to ride came at NE 60th, where the new design uses green stripes and sharrows to indicate that bikes should proceed straight ahead while cars (which are still moving at fairly high speeds) cross into a right turn lane. I agree with Spiffy. At the same time that they created the bike lanes on Division, on 60th northbound from Division to Lincoln they removed parking and added a bike lane, as if to encourage you to turn right, ride up to Lincoln, and turn left to continue westbound. (Meanwhile they added sharrows, but no bike lane, southbound on 60th from Lincoln to Division.) Which is nice because there’s this bike shop at Lincoln and Cesar Chavez that my friends and co-workers love. And Jonathan, though you didn’t see a lot of people on bikes on that outer stretch of Division, that doesn’t mean they aren’t around: you’ll see a lot more a quarter of a mile south, on Woodward, which is the extension of the Clinton bike thing from 51st to 82nd. These changes to Division are so significant that it’s actually pleasant to walk that stretch of road now, but on a bike I still prefer Woodward, where bike traffic often outnumbers car traffic. The message is: once you get to 60th, they want you to go someplace else on your bike. Seems crazy, since most cyclists want to go to the same commercial destinations on inner SE Division as everyone else. As a resident living 2 blocks south of this stretch of Division, I love the improvements. While I still choose Woodward/Clinton to head in to town, it makes the connection to Lincoln much nicer. However, the biggest improvement for me personally is that it’s now much more comfortable to walk there with my 7-yr old without having cars zooming by inches away. Since there’s no parking strip, the bike lane provides a much needed buffer between pedestrians and the traffic. 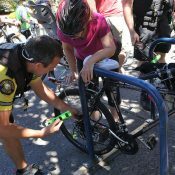 Thanks to PBOT and the neighborhood associations that made this happen! I love the improvements and use it all the time. Considering I live a little closer to Division than Woodward. And I do like the lane up to Lincoln on 60th as well. As for the turn lane at 60th I’ve yet to have a problem just taking the lane (of course I sometimes did that before the lane reductions). Though I got to agree that some of the pavement in the lanes is pretty chopped up, more so on the north side of the road than the south side. And mind you 25 riders on Division a couple months ago would have probably taken you 2 or 3 hours on a nice day, except perhaps people crossing at the 75th/76th street intersection. And I haven’t had to adjust my drive times either. Pretty much the same as it was before. And cross traffic between Division and Powell seems slower and of a lower volume than before as well. The 8 blocks from 52 to 60 east bound on Division isn’t too bad either. The road is pretty wide, unless something is going on at Atkinson few cars ever park there, I find it easier than taking the hill on 51 on the Clinton/Woodward greenway. PS- As for Dairy Queen, it’s easy to take Clinton (if you’re heading west) into the back side of Atkinson Elementary School/Clinton Park, take the path between the building and the basketball courts to a little path/driveway that runs north and drops you off right across the street. So happy to see this go in! I used to bike to PCC this way, and the bikelanes will make it so much more pleasant for students now, especially with the Division Campus being demolished and rebuilt to increase student capacity lately. On a related note, does anyone have photos of the recently re-striped Glisan Street? I’m curious. 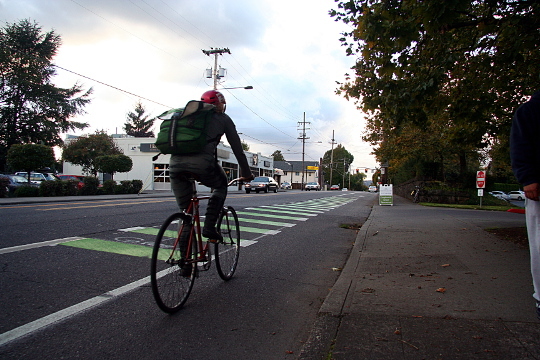 No bike lanes on Glisan….But traffic is definitely easier and calmer there too. As someone who lives in outer SE (as in east of 205), I really appreciate the fact that there is now a more straightforward route into inner SE. Previously I had to take disconnected bike routes on a back and forth route all while making the connections between sections by jockeying with traffic on streets not marked as bike routes or having bike lanes. And I agree, at 60th, you turn right up to Lincoln and if you’re seeking a destination on lower Division, you follow Lincoln down to the cross street your destination is on and then jump back over to Division. We’re lucky that Portland is mostly on a grid and simply moving over a street or two is often much safer for bikes and cars alike. What a crock of BS. SE Division is a local public street that should be safe for and accessible to all modes. Why should cyclists have to expect to make this convoluted detour, including prior research to determine exactly which cross street your destination is closest to? 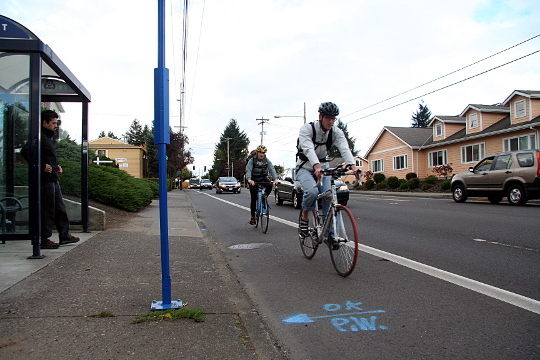 Are you aware that historically, SE Division was one of the premier improved bike routes (along with SE Stark) in SE Portland? Division is and attractive bicycle route not only because of the many destinations along the street, but also because it is a relatively flat low-topography route compared to the parallel greenways, and the major intersections are all signal controlled and easier and safer to cross at. Oh of all the inconveniences! While I don’t care for Clinton much at all, as a person that regularly commutes from near 205 I find Lincoln both a nicer ride and just as fast than taking Division the entire way. Certainly that’s your choice; but you and Mary and everyone else who fears the traffic and falsely believes that cyclists don’t need to be safely accommodated on SE Division through the commercial district because there is a parallel bike route a few blocks away should at least be able to recognize that there are plenty of other cyclists who believe otherwise, and support their opinion even though it’s not where you personally want to ride. I don’t think bike lanes = safe accommodation. I especially dislike jersey barriers & the like. I actually might prefer what this stretch was before the re-alignment, before I had a whole lane to myself, now I have a mediocre strip in the worst part of the road. I could give you a hundred more reasons why I could care less about improving Division any further, but what it really comes down to is I hate how it is being re-developed, I hate the people who are moving into the neighborhood, and I’d hate to see the city spend another cent on this area when they could be improving bicycle access where there is none.